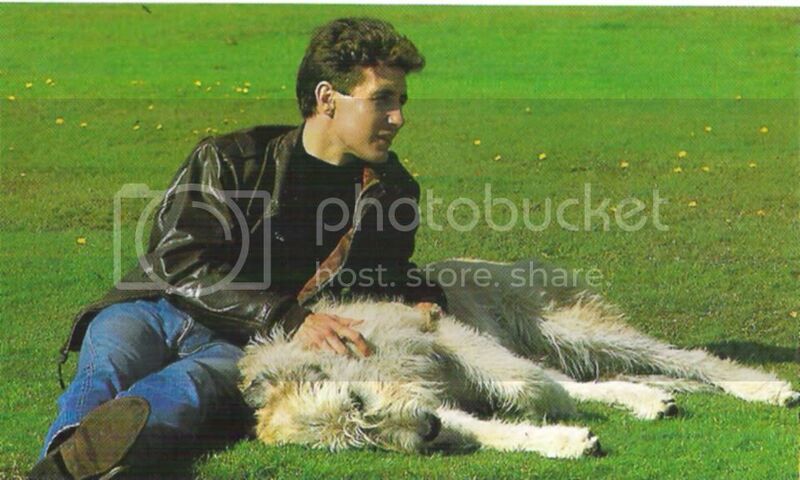 Have found this pic of Paul taken in 1989 and thought it would brighten up everyone's day! It was from an article entitled "Dreamy Paul McGann" written in 1989. I will type up the article for you this week but for now - just enjoy!!!!! HOLY BLOODY WOW! ! ! ! ! ! ! ! You two are costing me a fortune in smelling salts! He's well worth it! Dreamy Paul-an understatement, surely? icons over at the LJ. Now, I've got MORE tempting candidates! spoiling us! I love it! Can't wait for the article. 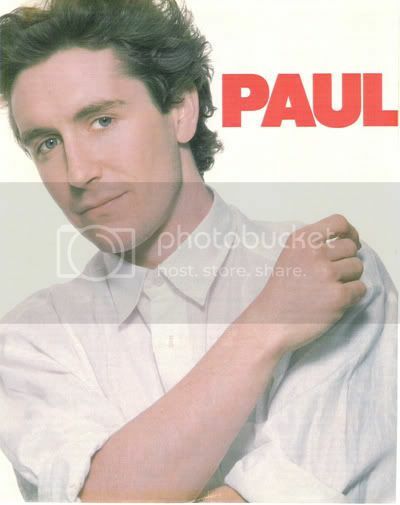 I love just love 'eighties Paul'--sort of 'machismo' and 'puppy', all rolled into one. *SIGH* Dealers was that year, too. He was at his machismo-puppy best in that one--very young and strutty. Thanks Sam! Look forward to the article, too! Does he have to be so bloody gorgeous! I'm afraid so, Cat, and it's our challenge in life to deal with it as gracefully as possible, hard as that may be at times. We just gotta buck up, and take it like the women we are, y'know? the maturity! I shall quite unashamedly freak out-and ! Oh, yeah! Catherine's gone freak again! 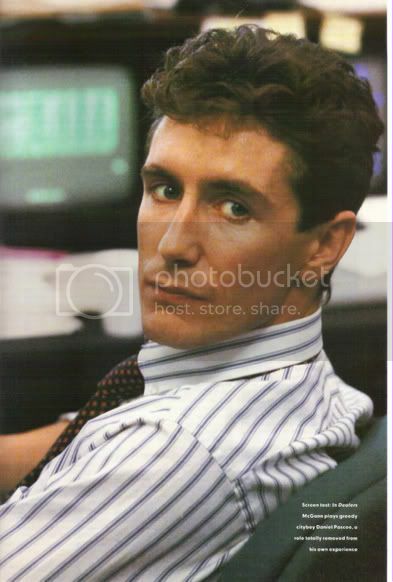 "Paul McGann takes a break from the dog eat dog world of high finance"
OK, this has really got me confused - the first pic is alot smaller that the second one so why has it come out bigger?!? - The second one was a full page! Any ideas why? >OK, this has really got me confused - the first pic is alot smaller that the second one so why has it come out bigger?!? - The second one was a full page! Any ideas why? It has something to do with the scan Resolution you set it for, versus the output size. When you scanned, were they both set for 100% output size? Or did you increase the output size? They say a resolution of 72 ppi is a good resolution for computer screen viewing of jpegs at 100 percent, that is, good when you keep the same size of the original. A pic you make larger on screen than the original copy, or larger than its 100 percent original size, needs to have the scan resolution increased so you don't loose pixel detail as you make it bigger. That gives it the right amount of pixels it needs to compensate for the bigger size, anything over its 100%. There's a formula, which I don't have memorized. Somehow, the resolution looks like it might have been increased for the Dealers pic and maybe decreased for the second scan? Or the second scan's output size was set to less than 100 percent? if you used 72 ppi as resolution. It gets a little complicated. I'll just reiterate what Akka said - THUD! Ya know after watching Paul in Alien 3 last night... it's nice to see some Dealers pictures. I'm just sayin'. Aww!! His hair is so foofy there! I mean, it's always kind of foofy, but that's a lot of foof! Thanks to indefatigable for the word foof, because otherwise I wouldn't have a word to describe his hair. Foofy?? That's cute. I like it.